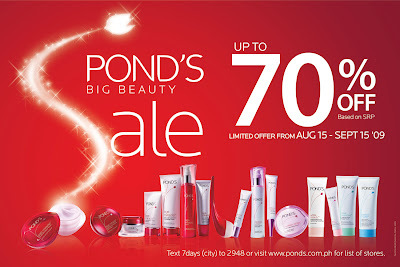 IAMBRIGITTE : SALE ALERT: POND'S BIG Beauty Sale! SALE ALERT: POND'S BIG Beauty Sale! ladies, now's the time to stock up on one of our favorite skin care items from PONDS, the global pioneer in skin lightening, as it gives its loyal consumers a chance to indulge in the bevy of their beauty products in its much-awaited and first-ever nationwide Big Beauty Sale! Enjoy as much as 70% off of Pond’s Age Miracle™ Microdermabrasion Kit, Pond’s Flawless White™ Vitamin Soak Lightening Mask, Anti-spot Intensive Whitening Serum and Light-infusing Under Eye Cream. Get 50% off with Pond’s Age Miracle™ Dual Eye Therapy UV, Overnight Repair Dream, Daily Resurfacing Cream, Concentrated Resurfacing Serum, Daily Resurfacing Cream SPF 15 PA++, Cream Pump, Day Cream Pump, Pond’s Flawless White™ Visible Lightening Day Cream and Re-brightening Night Treatment. Treat yourself with 20% off of Pond’s White Beauty™ Pinkish White Glow Lightening Cream and Pinkish White Glow Lightening Facial Foam, Pond’s Clear Solutions™ Anti-Bacterial Facial Scrub, Breakout Control Lotion and Oil Control Cleansing Foam. Discover the beauty within with Pond’s. Grab onto your seats as the Pond’s Beauty Sale runs for a limited period only, starting August 15 until September 15. Text 7days (city) to 2948 (i.e. Text 7days (Manila) to 2948). Or log on to http://www.ponds.com.ph/ for a list of participating stores nationwide.